This category doesn't contain different models of retractable banner stands than are found elsewhere on our site, but rather it's a category of special uses for this popular style of banner stand. In this category, we have created some special banner variations for retractable displays that make them into unique banner displays with depth and dimension. While any of our large selection of banner stands can be used in this way, we have selected some of our favorite models that seem best suited for this purpose. However, if there is a different model of stand that you have, or would like to purchase, we can adapt these banners to work in any display. The dimensional banner stands consist of either clear banners, or banners cut into irregular shapes. In some cases, multi layered effects are created by utilizing double sided banner stands but with both banners facing the same direction. The banner in back is used as a background, while the banner in front is either cut into a shape that exposes the background, or is printed on a clear film that allows the background to be visible through the clear areas. Most of the examples you'll see on our site show a figure on the front banner that is printed on clear with a white underprint for opacity. This is the same technique used on the single sided banner stands with a clear banner. The effect is almost three dimensional and very eye catching. It's also possible to not use the white underprint so the background shows through the entire printed image and not just the clear areas, however this will also allow the support pole to be visible. In the samples we created, we purposely selected images that would hide the support pole, and there are many creative ways to accomplish this. We've even had some customers allow the support pole to show, and actually made it part of their design. Most of the stands we've selected for this category feature an adjustable height support pole. In our experience, it's a very useful feature with clear banners, as it looks best if the image on the banner extends from the base to the top rail with no gaps so that the support pole can be concealed, and having an adjustable height makes it easier to make the banner fit the design, rather than having to make your design accommodate a fixed banner size. These make an excellent altnernative to cardboard standees. 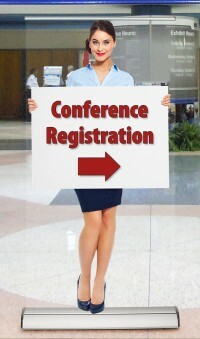 Retractable standees are printed at a higher quality, don't have the visible seams and folds that the cardboard styles have, and since the banner retracts into the base when it's not in use, they are much easier and cheaper to transport, and less likely to get damaged making them usable for a much longer period of time. This makes them ideal for use at events where it's common to store and then use the same display again at another event. Look through our selection and, as always, feel free to contact us with any questions you have on these unique and eye-catching banner stands.